Excuse me, but I have a serious complaint for the post office. They must have misplaced my invitation to Chrissy Teigen's baby shower in the mail. I mean, why else would I not have known about the mom-to-be's celebration on Sunday? Alright, alright — I'll admit it's unlikely I would have actually snagged an invite to the festivities, but hey, a girl can dream. And at least I can live vicariously through the photos posted on Instagram. John Legend shared a picture from Teigen's baby shower, where he's wearing a bedazzled "Baby Daddy" crown and it's absolutely perfect. Some people may think it's tacky, but I think it's all in good fun. 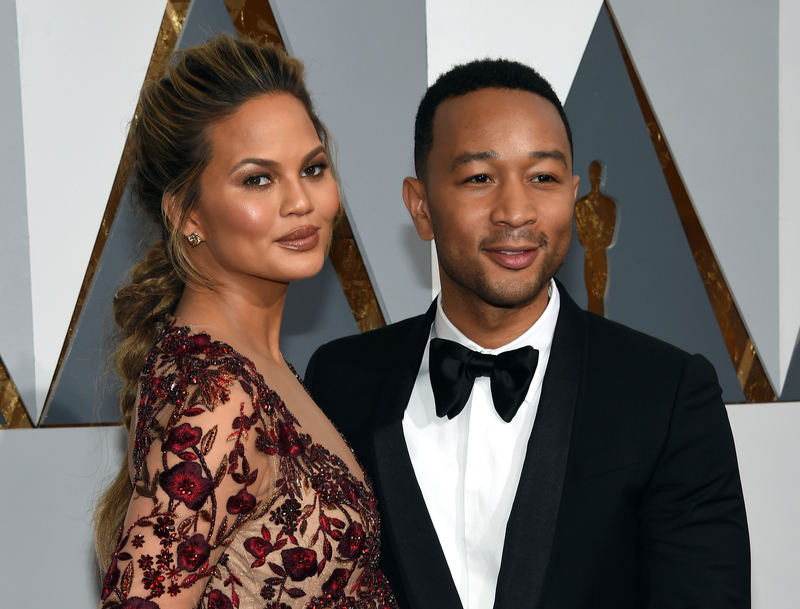 As the father-to-be, he deserves to be treated like a king, while Teigen serves as queen. Doesn't it seem like just yesterday Teigen announced her pregnancy? Then again, the baby will be here before fans know it. On a recent episode of The Late Show With Stephen Colbert, she said she's expecting the baby in mid-April. The Sports Illustrated swimsuit model said, "The countdown is on." Here's a round-up of photos from the baby shower. Considering she recently released her cookbook Cravings , there probably were some drool-worthy snacks. Perhaps Legend sang a song or two. Maybe they threw around some baby name ideas. I bet there were games, too. The one thing I know for sure is that I have some serious FOMO. In case anyone had any doubts about how seriously Legend takes his upcoming role as a dad, this should quiet the skeptics. Plus, in the aforementioned Colbert interview, Teigen said that the "All Of Me" singer is going on paternity leave all summer after their daughter is born. Sure, this photo is adorable, but I care more about Teigen's braid. Can we talk about how flawless her hair looks? Such a perfect ponytail. Even before any human babies were on the way, the Legends became parents to three dogs. They've got Puddy, Pippa, and Penny. Luckily, it looks like one of the dogs attended the baby shower too. These may be the most beautiful cookies I've ever seen. How cute are those little crowns and tutus? Because of course there's a "Baby Mama" crown to match the "Baby Daddy" one. Of course! Based on all these photos, theres on denying that Teigen and Legend were treated like royalty at this baby shower — as they should be.